Dawn is maintaining its smooth and steady course through the solar system as it gradually closes in on Vesta. With the utmost patience and persistence, it continues thrusting with its ion propulsion system, heading toward its July rendezvous with the second most massive member of the main asteroid belt. Even as the spacecraft climbs farther from the sun, Earth's orbit is beginning to bring the planet closer to the probe. 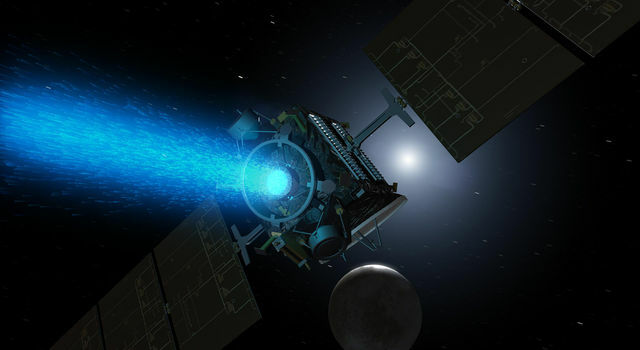 Having thrust for two-thirds of its time in space, Dawn has now achieved the velocity equivalent of about 5.5 kilometers per second (more than 12,000 miles per hour). We have seen before that this does not represent the actual change in speed, but it is still a very useful measure of the effect of the thrusting. 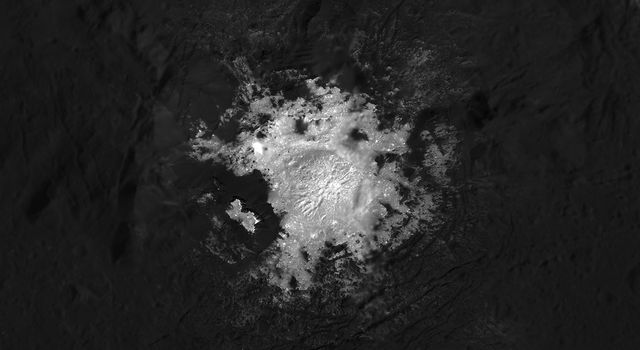 Although it has long since surpassed the record for propulsive change in velocity, Dawn is only now at the halfway point in the planned profile of thrusting for its ambitious eight-year expedition. 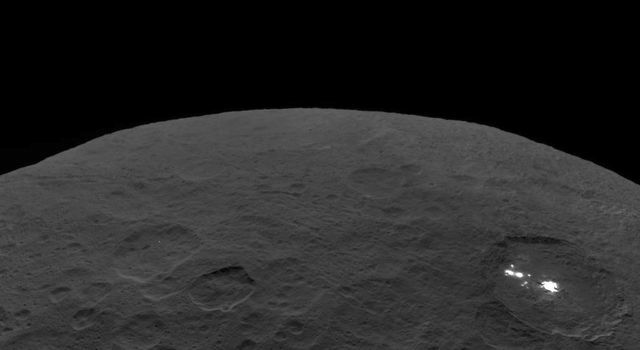 By the time it completes its mission at dwarf planet Ceres (the asteroid belt's most massive resident) in 2015, it will have accomplished twice the effective velocity change it has achieved so far. At the beginning of this month, mission controllers installed new parameters in the software used to control the spacecraft’s orientation (which engineers refer to as “attitude”) in the zero-gravity conditions of spaceflight. The attitude control system has four methods of keeping Dawn stable or turning to point in a new direction. When the spacecraft is not thrusting with the ion propulsion system, it has two techniques: it can rely on its reaction wheels or on its reaction control system. The wheels are gyroscope-like devices which, when electrically spun faster or slower, rotate (or stop the rotation of) the spacecraft. As we saw early last year, the reaction wheels alone are not sufficient, so when they are in operation, the reaction control jets also are used, although only occasionally. (The jets also are known as “thrusters,” nomenclature used in previous logs, but to avoid confusion with the ion thrusters in this discussion, we will refer to them only as “jets.”) The conventional rocket propellant hydrazine is fired through the jets to impart a small force to the ship, causing it to turn or to stop turning. Not content simply to coast through the solar system, as most interplanetary probes do, Dawn devotes the majority of the time to using one of its ion thrusters to change its course, constantly applying a light pressure to its orbit to bring it closer and closer to that of its destination. In addition to accelerating the ship, an ion thruster can be used to rotate it by slightly changing the angle of the thrust. This provides the attitude control system two other means of control when the spacecraft is in powered flight: it can use either the thruster plus the wheels (again with the occasional help of the reaction control system) or the thruster plus the more frequent use of the jets. Over the summer, engineers powered the reaction wheels off, preserving them for use in orbit around Vesta and Ceres. The reaction control system took over quite smoothly and has been keeping the craft stable ever since, most of the time in concert with the ion propulsion system. The new control parameters were finalized after extensive analysis and simulation at Orbital Sciences Corporation and JPL. Without needing to change the software, operators radioed the values to Dawn in October and timed them to go into effect on Nov. 1 during the normal weekly hiatus in thrusting (and thus when attitude control is reliant exclusively on the jets) to point the main antenna to Earth. Thanks to this successful upgrade, the system now uses only about one-eighth as much hydrazine during those periods that it is holding steady and not applying ion thrust. To rotate from one attitude to another requires firing some jets to start the huge ship (the largest NASA has ever sent on an interplanetary voyage) turning and then others to stop it. To achieve a further savings in the hydrazine, controllers reduced the rate at which Dawn executes its turns. The standard speed had been a whiplash-inducing 0.1 degrees per second; that’s the same pace at which the minute hand of a clock moves (except for some of the clocks sold in Dawn gift shops, and we’re still processing your refund requests on those). On Nov. 1, the speed was lowered to half that, meaning less propellant is needed to initiate a rotation and less is needed to terminate it. The only turns in a typical week are those required to shift between the attitude required for ion thrusting and the attitude required for pointing the main antenna to Earth, and a little extra time spent turning is easily affordable. On Nov. 8, all four reaction wheels were powered on for a short time. For wheels 1, 2, and 3, this served as routine maintenance, keeping them in top condition so they will be ready to return to duty as the Vesta phase of the mission begins next summer. Running wheel 4 provided additional data on its condition so that engineers could assess its long-term prospects. Dawn is 0.083 AU (12 million kilometers or 7.7 million miles) from Vesta, its next destination. It is also 3.05 AU (456 million kilometers or 283 million miles) from Earth, or 1235 times as far as the moon and 3.09 times as far as the sun. Radio signals, traveling at the universal limit of the speed of light, take 51 minutes to make the round trip.